SewGreen is a non-profit located in the Commons and is part of Sustainable Tompkins. Its goal is to reduce waste and promote re-using and upcycling by taking donations of fabrics, sewing materials, and knitting materials and re-selling them, donating them, or using them in their free and/or low-cost classes for children and adults in schools and their store. They also host a yearly design competition and fashion show and hire many teenagers and young adults. In short, they do a whole bunch of wonderful things for both the community and the environment. 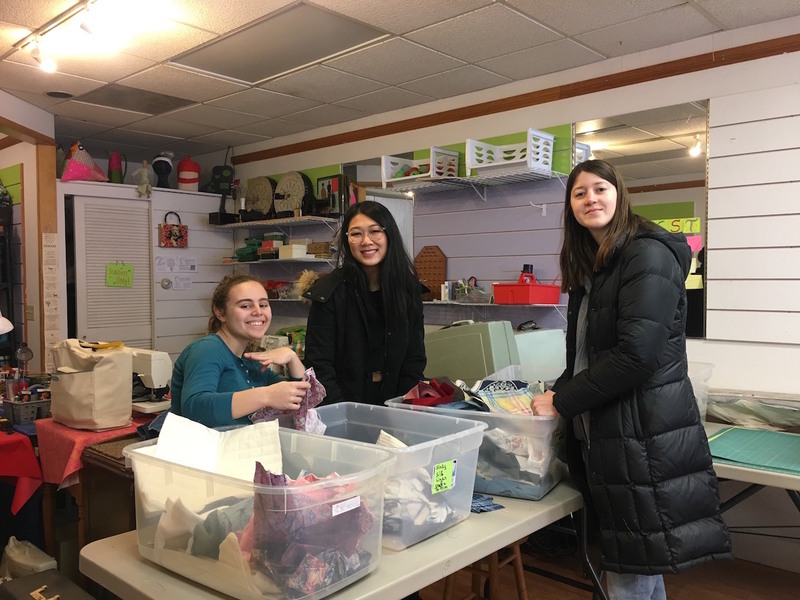 When you volunteer at SewGreen, there is a wide variety of things they may ask you to do, such as sorting out donations, organizing the store, and helping out in the classroom. All of these activities are really easy to do, and the staff members are incredibly welcoming and love talking. Sometimes, if they are working on special projects, you may also learn something really cool. The first time I volunteered in SewGreen, Wendy Skinner—the founder of SewGreen—was organizing sets of fabrics for their annual design competition and asked two other volunteers and me to help label and package them. For each set of fabrics, she made sure we felt every piece before telling us what type of fabrics they were. And if she was slightly unsure from touch alone, we would do a burn test, in which we burn a small piece of the fabric and the way it burns tell us exactly what the material is. I ended up learning how to distinguish between cotton, silk, velvet, linen, damask, batiste, and more! Of course, I don’t get to learn about fabrics every time I volunteer there (most weeks, I help sort donations or organize the store, which is really relaxing because Wendy and other staff members never pressure you to work quickly and truly appreciate any help they can get), but opportunities like that pop up quite often. And if you do want to learn anything about fabrics or sewing, the staff members would love to answer any questions. Wendy even offered to teach anyone who volunteers at least twice how to use a sewing machine! Volunteering at SewGreen is super fun and meaningful and you can potentially learn a lot. I encourage anyone who’s interested to sign up. The Commons really isn’t that far! Lastly, they have a free bin of fabrics and other items so if you ever want to sew something/start a project, they have you covered!